Lander County is a county in the U.S. state of Nevada. As of the 2010 census, the population was 5,775. Its county seat is Battle Mountain. Lander County was created in 1862. It was one of the 11 counties in Nevada when it became a state in 1864. It was named for Frederick W. Lander, chief engineer of a federal wagon route through the area in 1857. He later served as Special Indian Agent in the area, and died during the Civil War in Virginia in 1862 at the rank of brigadier general. 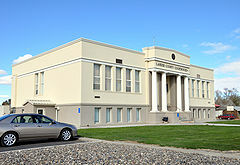 Created in 1862, Lander County sprang forth as the result of a mining boom on the Reese River, along the old pony express line; taking a considerable portion of Churchill and Humboldt counties with it. Eventually, Lander County would be known as the "mother of counties" since three other counties in Nevada were formed from it: Elko, White Pine, and Eureka. Its first county seat was Jacob's Spring in 1862 which was soon after moved to Austin in 1863 and finally Battle Mountain in 1979. According to the U.S. Census Bureau, the county has a total area of 5,519 square miles (14,290 km2), of which 5,490 square miles (14,200 km2) is land and 29 square miles (75 km2) (0.5%) is water. The 11,477 ft (3498 m) summit of Bunker Hill, located in the Toiyabe Range near the Nye County border, is the highest point in the county while the county's most topographically prominent peak is Mount Lewis. As of the census of 2000, there were 5,794 people, 2,093 households, and 1,523 families residing in the county. The population density was 1 person per square mile (~2.5/km²). There were 2,780 housing units at an average density of 0 per square mile (0/km²). The racial makeup of the county was 84.41% White, 0.21% Black or African American, 3.99% Native American, 0.35% Asian, 0.03% Pacific Islander, 8.66% from other races, and 2.35% from two or more races. 18.52% of the population were Hispanic or Latino of any race. There were 2,093 households out of which 39.70% had children under the age of 18 living with them, 59.70% were married couples living together, 8.10% had a female householder with no husband present, and 27.20% were non-families. 22.30% of all households were made up of individuals and 5.00% had someone living alone who was 65 years of age or older. The average household size was 2.73 and the average family size was 3.23. In the county, the population was spread out with 32.20% under the age of 18, 6.80% from 18 to 24, 29.00% from 25 to 44, 25.00% from 45 to 64, and 7.00% who were 65 years of age or older. The median age was 34 years. For every 100 females there were 105.50 males. For every 100 females age 18 and over, there were 105.50 males. The median income for a household in the county was $46,067, and the median income for a family was $51,538. Males had a median income of $45,375 versus $22,197 for females. The per capita income for the county was $16,998. About 8.60% of families and 12.50% of the population were below the poverty line, including 13.50% of those under age 18 and 12.90% of those age 65 or over. As of the 2010 United States Census, there were 5,775 people, 2,213 households, and 1,545 families residing in the county. The population density was 1.1 inhabitants per square mile (0.42/km2). There were 2,575 housing units at an average density of 0.5 per square mile (0.19/km2). The racial makeup of the county was 84.0% white, 4.2% American Indian, 0.4% Asian, 0.3% black or African American, 8.6% from other races, and 2.5% from two or more races. Those of Hispanic or Latino origin made up 21.1% of the population. In terms of ancestry, 19.4% were German, 13.6% were English, 12.2% were Irish, and 12.0% were American. Of the 2,213 households, 37.1% had children under the age of 18 living with them, 54.5% were married couples living together, 9.4% had a female householder with no husband present, 30.2% were non-families, and 25.6% of all households were made up of individuals. The average household size was 2.60 and the average family size was 3.14. The median age was 37.1 years. The median income for a household in the county was $66,525 and the median income for a family was $67,157. Males had a median income of $62,932 versus $33,056 for females. The per capita income for the county was $25,287. About 11.7% of families and 12.2% of the population were below the poverty line, including 17.0% of those under age 18 and 7.4% of those age 65 or over. ^ a b "State & County QuickFacts". United States Census Bureau. Archived from the original on July 13, 2011. Retrieved September 23, 2013. ^ Gannett, Henry (1905). The Origin of Certain Place Names in the United States. Government Printing Office. p. 180. Retrieved 2016-01-01. ^ "Bunker Hill, Nevada". Peakbagger.com. Retrieved 2014-10-12. ^ "U.S. Decennial Census". United States Census Bureau. Retrieved December 20, 2014. Theodore, T.G. and G.M. Jones. (1992). Geochemistry and geology of gold in jasperoid, Elephant Head area, Lander County, Nevada [U.S. Geological Survey Bulletin 2009]. Washington, D.C.: U.S. Department of the Interior, U.S. Geological Survey. This page was last edited on 28 February 2019, at 01:02 (UTC).